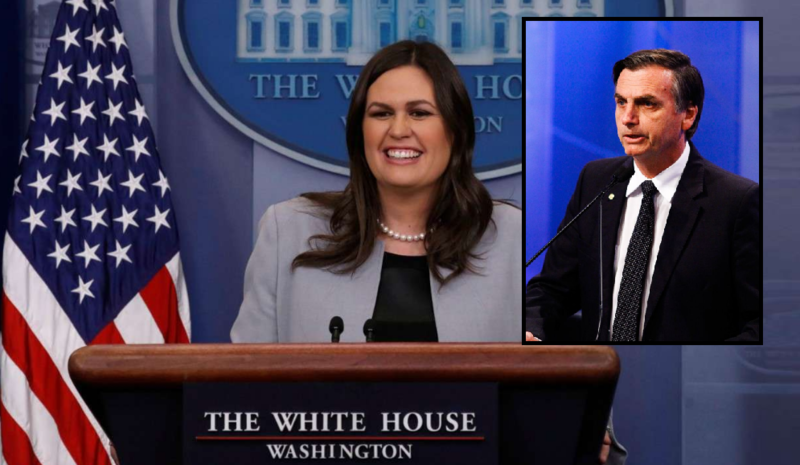 White House Press Secretary Ms. Sarah Sanders confirmed on Monday that members of Mr. Trump’s cabinet had contacted Mr. Jair Bolsonaro’s family in the aftermath of the stabbing attack on the leading presidential candidate in Minas Gerais last week. The statement was being made after questions arose in the White House daily briefing whether the Republican US President had reached out, called or sent a message to the PSL candidate for the Brazilian presidency. Related coverage: <a href="https://thegoldwater.com/news/36696-Brazil-Election-Rightwing-Conservative-Bolsonaro-At-30-In-New-Poll"> Brazil Election - Rightwing Conservative Bolsonaro At 30% In New Poll</a>. Ms. Sanders replied: “I am not aware that the president has done so, but I believe members of the administration have come out in contact,” promising to deliver more details shortly. The news comes at the same moment that Mr. Bolsonaro’s doctors confirmed that he would need more major surgery after he was stabbed during a campaign rally on Thursday last week. The 63-year-old remained in intensive care following the attack by a lone assailant with a history in the socialist political party. At the time, he suffered a deep and life-threatening wound to his intestines and lost 40% of his blood, arriving near dead in the hospital. Related coverage: <a href="https://thegoldwater.com/news/36524-Brazil-Investors-Bookies-Agree-Bolsonaro-s-Chances-For-Presidency-Risen-After-Attack-Video"> Related coverage: Brazil – Investors, Bookies Agree Bolsonaro’s Chances For Presidency Risen After Attack (Video)</a>. The news comes as a setback to Mr. Bolsonaro’s supporters as on Sunday, doctors had still declared that his condition had "improved markedly" and that he was spending more time out of bed.